Softvision Explorer software can completely manage Cyber Café, Hotspot (Lan2, RADIUS) and Call Shop. The process is composed of five modules: Explorer Server, Explorer Manager, Explorer Client, Explorer Printer Monitor and Explorer Coins. The manager and the server are installed on a server workstation (main) while Explorer Client (only for Cyber Café usage) must be installed on navigation workstations. The module Explorer Printer Monitor is used to detect the print-outs made by the user and should be installed on computers connected to USB printers only if they do not already execute Explorer Manager or Explorer Client. Lastly, module Explorer Coins allows you to create a recharge workstation using an electronic coin acceptor. Remember that if being used as a Hotspot or Call Shop, the only module to install is Explorer Manager. Keep in mind that, for use as a Hotspot or Call Shop it is only necessary to install the Server and Manager modules. 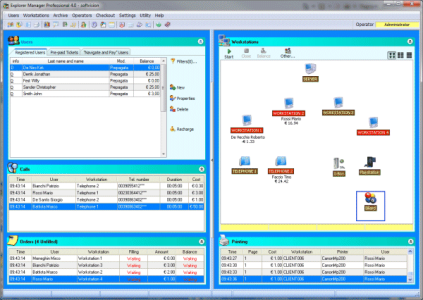 The VoIP functionalities of Softvision Explorer allow connection to the hardware and software type SIP telephones system. Thanks to VoIP technology you can also make calls at considerably lower costs compared to those of normal telephone operators. This is the module that manages the server. It is used to enter new users, recharge accounts and monitor the usage of the workstations, etc. 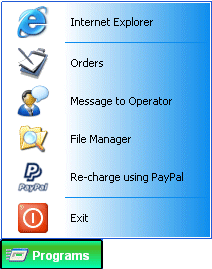 Users: this section displays the list of customers in the archive and several buttons for creating or modifying a user or recharging his credit. Calls : it displays all the calls made during the day. Various information is shown for each call : the customer who made the call, the telephone number called, the workstation and the cost of the call. Workstations: the right side of the window lists the workstations and their status. Orders: monitors the status of customer orders. The title bar of this section displays the number of unfilled orders (in parentheses). Printing : this area lists the printouts made during the day. Explorer Client is the module, available for Windows and Linux, that gives customers controlled access to the navigation station. Once launched, the program takes control of the machine and prevents the user from doing anything that could damage the Windows configuration (deleting system files, accessing the hard disk, task manager, etc.). From then on, the computer can only be used to navigate or to run other programs selected by the system administrator. Closing the program requires the administrator's password, which is set to "password," by default. To start navigating, the customer enters his username and password or inserts his Smart Card. As soon as he logs in, a TaskBar appears in the lower part of the screen that is just like Windows'. The right side of this bar displays connection information, such as: connection time, credit used, residual credit and username connected. Softvision Explorer is able to transform your location into a Hotspot which conforms completely to the anti-terrorism laws. Your customers can connect directly to the internet using their laptops (Windows, Linux, Mac OS X, etc. ), PDA, mobile phones and any kind of device which has a wireless network card and a browser. Wireless connections take place through an open Access Point (wireless router). There is therefore no protection (WEP etc.) to make the wireless networks secure. The server on which Explorer Manager is installed has the task of only allowing connections made by users who have a username and password. 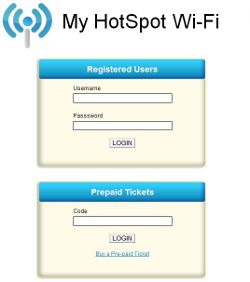 Hotspot on LAN 2 : this type of Hotspot is based on one or more wireless Access Point connected, possibly through a switch, to a second network card (LAN 2) on the server. RADIUS Hotspot : uses wireless systems that communicate with Softvision Explorer using the RADIUS protocol. It is possible to use any wireless router that supports DD-WRT and CoovaAP firmware (Linksys 54GL, Netgear Wrg614 etc.) or any other system that supports the RADIUS certification (Mikrotik etc.) . Now let us see which operations a user needs to carry out to connect to a Hotspot. When customers are within range of an Access Point at your location, their computers are automatically able to find the wireless network and connect to it. For this to be successful, the customer’s wireless network card must be set up to obtain the IP address and DNS server automatically. Softvision Explorer can be used to completely manage a Call Shop using VoIP technology. Saving on the cost of telephone lines : there's no need to install particular telephone lines to open a VoIP Call Shop. All the calls are routed via internet, therefore you only need a good quality ADSL line. Saving on the cost of calls : the cost of a VoIP call is generally much lower than those made using a traditional telephone line. Furthermore, there is an additional saving as the program can route the calls using carriers with the lowest rate for the particular prefix called by the user (least cost routing). System expansion: to add new telephone settings you only have to connect other telephones to your network. Creating a Call Shop using Softvision Explorer is really easy : you only have to connect the SIP telephones to your local network, configure Explorer Manager with one or more provider VoIP accounts (carrier) and you can start accepting calls immediately in your premises.